SHOW UP IN STYLE - If you're bringing brew, you want them to arrive cold and ready. 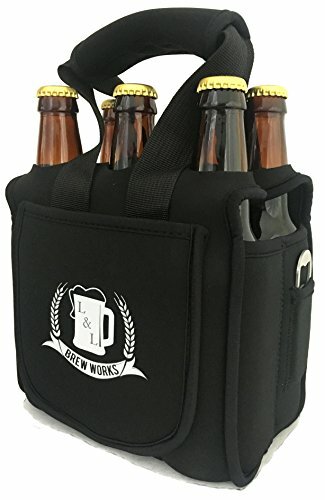 Load up your favorite six pack into this insulated black neoprene caddy. The pockets stretch to fit everything from cans to longnecks in any combination. The thick soft neoprene will keep your beer cold for hours. We've also added a convenient full width front pocket for accessories. Toss in your phone, wallet, keys, or other essentials and you're ready to go! KEEP THOSE BEAUTIFUL BEVERAGES SAFE - You don't want those high quality premium craft brews clinking and clanking around in some lousy cardboard box. All that shaking and banging is bad for your carbonation and your sanity. Besides, a little moisture and your sweet brew could take a disastrous tumble! Your favorite drinks will fit snug, separated and protected by the full thickness neoprene divider inside. No more shaking, banging, or rattling! GET A GRIP - Who wants to risk dropping your liquid treasure?! Unlike other designs, our caddy features no-stretch nylon carry handles mounted outside the top flaps, allowing them to stay put on the bottles when lifted. Inside, more nylon wraps around the bottom for strength and security. Those babies are going nowhere, besides into your belly! AVOID THE AGONY - Beer beer everywhere and not a drop to drink! How awful to have a frosty six-pack in front of you with no way to get to it. Fortunately, we've included a high quality brushed stainless steel bottle opener, nestled snug in its own special pocket, so you'll always be ready to crack open a new one. Makes a great gift for your beer lover! SERVING UP HAPPINESS - Locked & Loaded Brew Works was founded by a couple of beer loving friends who know what service means. An Army veteran and a Critical Care Nurse who've spent their lives in service to others have teamed up to serve you too. Our motto: Beer Stuff for Beer People! We don't take ourselves too seriously though. If it's not fun, it's not worth doing. If you aren't delighted by our products then you're not having fun. Just let us know and we'll fix it. If you have any questions about this product by Locked & Loaded Brew Works, contact us by completing and submitting the form below. If you are looking for a specif part number, please include it with your message.